Some 46 million pounds of 2,4-D are used in the United States every year, with about 11.5 million pounds used in lawn care as part of more than two dozen brands of weed killers or “weed and feed” products, EPA figures show. Exposure to 2,4-D can cause damage to the nervous system, liver and kidneys, according to the EPA’s website. EPA classifies 2,4-D as a hazardous air pollutant. Children are particularly susceptible to 2,4-D exposure if they breathe indoor air or dust, following a lawn application. The chemical can be tracked into the home on the shoes of the person applying the herbicide. Recreational swimmers also can be exposed where the herbicide has been used to control aquatic weeds. Solomon says consumers should look at the labels of the herbicides they use and avoid products containing 2,4-D, which may also be listed as diethanolamine salt and 2,4-dichlorophenoxyacetic acid. In addition to lawns, 2,4-D is also used in pastures and rangeland, and on farms growing wheat, corn, soybeans, sugarcane and other crops. EPA does not classify 2,4-D as a carcinogen, but studies have linked the chemical to higher rates of non-Hodgkin's lymphoma among farm workers using the weed killer. So could this be why my son and 1 in 70 American boys in the US has autism? not to mention a host of other neuorological, cogntive, and immune problems that afflicting so many kids in our country?? It could be, but 2-4D has been in widespread use for fifty or sixty years now, two or three generations. The apparent uptick in autism is very recent. Possibly, but it could also be the phases of the moon, or all the drugs folks did back in college...or maybe the dramatically changing diagnostic environment..... Was there actually any precipitation back when it was only called "rain"? The SCIENCE doesn't support the ban, so just don't do it. Policy based on irrational emotion is completely counter-productive. Yes, it could be this or the GMO’s in our food, it could be the vaccines. We live in a toxic world. Science DOES support a ban! Science tells us that this is harmful to our bodies. Dah! What I meant was: is NOT caused by later environmental triggers. I should have my morning coffee before I post. Isn't this the same nasty product that has been banned from use in Calfornia's forests decades ago, for having caused an array of farmland stillbirths and birthing anomolies? 2,4-D and its nightmare cousin 2-4-5-T BOTH contain Dioxin,,, THAT is the main subject being avoided here,,, RADIOMIMETIC Dioxins. Dow Agrosciences AND Monsanto should have been Criminally prosecuted decades ago for POISONING America. I guess that Weed-Be-Gone is now another thing I have to buy a lifetime supply of. Add a couple cases of 100 watt incandescent light bulbs to your list. Conrad, I already have purchased my "lifetime supply" of incandencent light bulbs. I HATE those cf bulbs. You have to recycle them, and if one breaks you have to air out the room, not to mention that they provide much less light than incandescent and you can't use them with dimmers. I have seventeen light bulbs in my 3 bedroom house and all are on dimmers. That is how I cut down on electric consumption....dim them when you are not needing the full light in that room. You still have to pull the weed after they have died or it comes right back bigger and stronger. Or you could just get off your behind and do some manual weeding. Dad sprays the grass to ensure a perfect lawn this year...a couple of days later the kids play in the sprinkler and slide around on the grass. Everything you eat is made of chemical. Don't be scared of chemicals. Chuck, do ya think maybe that is why there are so many diseases in this world, like cancer, etc.? It has been proven in testing (UGA) that 2,4 D will not lach or move with rain, irrigation, etc. 2,4 D has been under constant analysis and review (testing) for decades and there is NO proof of causing problems. This again is someone trying to regulate something based on inuendo. 2,4,5 T was the component of Agnet orange that was proven to be the problem and it was taken off the market in the mid 1970. The industry is regulated; maybe homeowners (who are proven to be the worst violators) should not have access to any chemical. Why don't people proofread their comment before they hit the enter key? You are the cause of all the dyslexia in the world! Our brains hit the brakes every time we hit one of your errors. The irony is you are trying to sound serious and credible with your unsupported opinion but can't manage your keyboard skills. Yay for another Winchester fan! You make the 4th srgaitht male I know who watch Supernatural. *grin*If only the DL for the latest episode is up already. The hiatus has been painful. *frowny*I got durian runtuh this week as my cousin is spring cleaning her room and is getting rid of some of her book collection. So Ima benefit! Hee! Here is an example of media scare-tactics, "2,4-D, which was one of two ingredients in the toxic Vietnam war herbicide Agent Orange." Notice how they casually raise the specter of Agent Orange. Baking soda is a common ingredient in chocolate chip cookies. But, that does not make baking soda fattening. Agent Orange was contaminated by polychlorinated dioxin, a really bad player which was a byproduct of its manufacture of the period. Yes, this is a major journalism failure on CNN's part. I think they taught us not to use such well-poisoning tactics in 10th grade. H2O is one of the largest ingredients in acid rain, yet it is found in our kitchens, bathrooms, and even sold in grocery stores. Let us ban this substance's use and production. Compass, this deadly chemical is called dihydrogen monoxide. It has been linked to many deaths. When will we wake up? The safest, cheapest way to kill weeds is with a hoe...and hoeing also fights ugly belly fat! If you think that manually hoeing thousands of acres of crop land is the cheapest way to eliminate weeds, then I suspect you have suffered a severe blow to the head. He obviously didn't get the joke, did he? The Hoes I know wouldn't work for those cheap wages. I'm sure Pimp Daddy Obammy has a few cheap "hoes" that can help,,,,,!!! The paper CNN links to, supposedly as evidence of this chemical causing cancer, is 22 years old and was based on a TELEPHONE SURVEY which asked cancer patients to recall how much weed killer of a particular type they used. Cancer-causing toxins generally take many years before cancer develops, so this absurd telephone survey is relying on their ability to remember accurately how much weed killer they used years in the past. Is that really the best example CNN could find to support this claim? Human memory is easily clobbered. The event of getting cancer, combined with the inherently suggestive nature of the survey, could easily account for a bias toward thinking they used a lot of this chemical. This is typical of NRDC's shoddy work. 'How MUCH' of the 2,4-D -(T0TAL Million #) was in the 'Agent ORANGE' sprayed in VietNam? 'How MANY' American Soldiers (of ALL US Services) contracted 'Agent ORANGE'-related Cancers? 'How MANY' Americans CAN be 'Expected to contract 'Agent ORANGE'-Related Cancers from the Amount Sold/Used ANNUALLY in America? But we don't even know if there is a prove cause/effect relationship between 2-4D and cancer. Okay folks, pay attention because Monsanto, Dow and others pay a lot of people to post on stories like this, to either defend the product or to attack the people telling the truth. 2,4-D is not a problem in the Agricultural industry because applicators on farms have to be licensed. The problem is letting these dangerous chemicals be used by home owners. 90% of all agricultural products are used on lawns, a stupid waste of money and time if you ask me but it certainly creates an unnecessary exposure to dangerous chemicals. We could solve most of America’s problems with dangerous Agriculture chemicals by removing them from public consumption. Exactly, in some parts of Canada, weed killer and other pesticides are banned for lawn use. The US should follow Canada's lead, banning the use of these dangerous chemicals for lawn use. These chemicals are bad for people, pets and the environment. spraying a yard with a toxic chemical soup is stupid. Interesting that people would rather argue that 2,4-d is safe (not really knowing if it is or not), rather than weed their own lawns or forgo the lawn all together. These chemicals affect other living things in the ecosystem. It's leachable, so our groundwater is being affected. Why not just do it yourself? Lots of people keep nice yards without poisons. Is it just laziness? Until it's proven safe, why risk it? Umm, the opinion of either an apartment dweller or an arid-country South Westerner. Definitely not a typical (for instance) Pennsylvanian homeowner. Sorry, my post landed under the wrong previous post. The Natural Resources Defense Council can take their environmentalist lies and stick them where the sun doesn't shine. After the global warming scam no intelligent person will ever listen to anything any environmentalist group says. By all means this should be stopped. It is very toxic and cancer producing. I lost a Scottish Terrier to the use of this. I lived in an aparrtment complex and he liked to lay in the grass. He started to pass blood in his urine so I took him to the Vet and they found a tumor in his bladder. He had bladder cancer. $8,000 later and nine months later he died. It is the same cancer that humans get but it grows slower. He was enrolled in a strudy at Purdue Vet school and they found the cause was 2,4D. weed and feed products have been shown, to be an epic fail. they simply don't work. however,the cons are many, polluted water supply, polluted air, yes these chemicals off gas, the vapor is unhealthy to breath. these products kill off earthworms, earthworms are needed for a balanced, healthy lawn environment. lawn pests can easily get out of control, leading to more pesticide use. more insects invading the home, termites love unhealthy lawns which require constant watering. 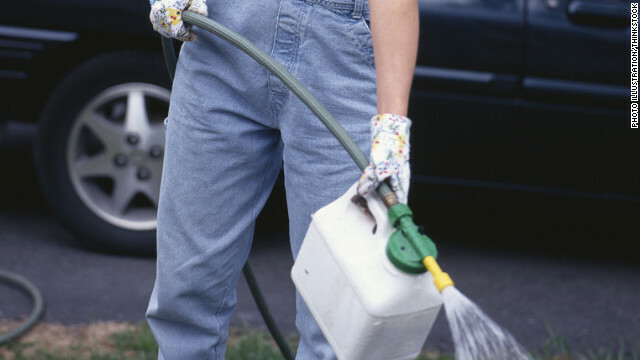 never purchase a home where lawn care chemicals have been used. These chemicals can be found in carpets, and these chemicals will not break down inside a home, due to lack of sunlight. polluting indoor air also. Most earthworms in the US are imported invasives and are causing a lot of damage to forests. Mix a pound of salt and half a gallon of water together. Pour only on the weed, take care not to splash on grass. Let weed die. Pull. You're done. We kill the weeds in the cracks of our sidewalks with...vinegar. That is basically the same as the effect of acid rain would have on a plant. Good thinking. Hhhhmmmm......I had a great yard, and my yard guys were pretty liberal with weed kill......my two yard guys died of gastric cancer in their early 50's, and my two dogs died of non-Hodgkin's lymphoma......I did a literature search, there is a link between these types of cancers and 2,4-D. They need to get this stuff off the market, there are alternative and better ways to care for the earth. It is about time someone challenged the EPA, they are in bed with the chemical companies. My dad used a lot of 2-4D on the lawn and we also lost a dog to the same cancer at age 7. Yeah that stuff is toxic.. EPA is incompetent. The EPA another governmental agency that is supposed to protect the public's health really protects big business bottom line! You're right. Thank God for for our state representatives. If they weren't resisting those lobbyists and making EPA regulate industries, we'd really be in trouble. Keep watching Fox News. They tell us the truth about liberals and their conspiratory agencies. Man! You mean a can't grow anymore weed? It seems theer are two kinds of posts about this emotive issue. Those with alot of fear and concern but very little knowledge, and those who have some understanding of the science, risks and the benefits of pesticides. Fear and ignorance is not a sound basis for public policy. Agent Orange was a specially made herbicide for the military. It got its name because all pesticides bought by the military came in the same olive drab can with yellow lettering. To prevent using the wrong pesticide the various pesticides used had a different colored stripe around the bottom of the can. Agent Orange was a three way tank mixture containing 2,4, 5-T, 2,4-D, and Silvex which are all phenoxy herbicides. The byproduct of the manufacture of the phenoxy's I think is dioxin. The stuff made for retail sale in the USA had the dioxin filtered out while military wanted the contaminate left in. Use one or quite a lot of our constantly up-to-date proxies to provide protection to your own web-based privacy.